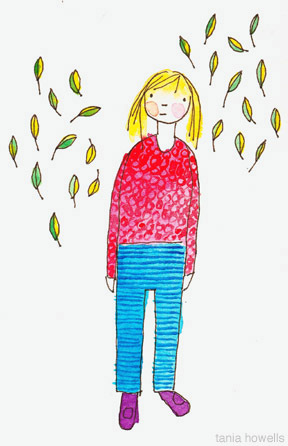 Here's me with a bunch of leaves swirling. More wishful thinking! Have you ever wanted something for so long that it becomes a habit and you have to think about it and see that maybe you don't want it really after all? Thats how I feel about an agent. I have always wanted to get an agent because I am horrible at solicting myself for work, but I get rejected by them all the time. Or just ignored. Lately I have been realising that I like not being too too busy. I have been getting enough work to please me and I don't want to have to quit my part time job which I love. I have been thinking a lot about how our society does not ever stop at "good enough" but is always desperate for more more more. How Wal Mart would rather close a store in Quebec, then let it's employees unionize, because among other things, that would lower their gross earnings. (correct me if I got that news item wrong, I often do) Anyway, one of my favorite quotes is "good enough is good enough". I think it is taoist or something. Sure I want a house someday, a baby, and I will need money for that, but I don't like the idea of being so busy that I can't putz around the house or walk to work slowly. You know, all of that good stuff! Speaking of good stuff, tommorow I get to go visit a baby! The baby of my ex from 10 years ago. This baby is the first of my friend's babies, so it's very exiting for me! The next baby is due in July . I can't wait!!! im with you tania. i tend to push towards an ideal or a goal with out realizing how great the things i already have are. is it really worth the stress? i think we emphasize ambition so much that simple happiness gets booted to the wayside. good enough is good enough! i love your self portrait, your cheeks are sweet! if you need a baby fix, you can always stop by my blog and watch a little huffster video! guaranteed to brighten your day! Another sweet drawing! The good stuff is totally what matters, taking time to smell the roses and drawing sweet lovely drawings like these makes life good. Thanks for sharing Tania! I think your work is wonderful. It is tough to break into any creative field. no matter how talented you are...as long as you are happy and your work makes you happy then you can't go wrong!! Babies are magical wonders. They make us think about the deepest dreams we have for ourselves and our futures. Why is that? having time to enjoy your life is so rewarding. my dad used to say if you enjoy your days you're having a good life. i agree. I know exactly what you mean. I always tend to overcommit myself... I think finding that balance is a talent to be learned. thanks fr all the great comments! it's nice to know we all have similar feelings!